An experimental station at SLAC's Linac Coherent Light Source X-ray free-electron laser, where scientists used a new ultrafast surface X-ray scattering technique to watch atoms move within a single atomic sheet. 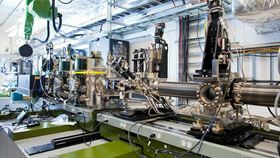 Photo: SLAC National Accelerator Laboratory. Using a never-before-seen technique, scientists have found a new way to use some of the world's most powerful X-rays to uncover how atoms move in a single atomic sheet at ultrafast speeds. In the study, researchers at the US Department of Energy's (DOE) Argonne National Laboratory, in collaboration with other institutions, including the University of Washington and DOE's SLAC National Accelerator Laboratory, developed a new technique called ultrafast surface X-ray scattering. As the researchers report in a paper in Nature Photonics, they used this new technique to reveal the changing structure of an atomically thin two-dimensional (2D) crystal after it was excited with an optical laser pulse. Unlike previous surface X-ray scattering techniques, this new method goes beyond providing a static picture of the atoms on a material's surface to capture the motions of atoms on timescales as short as trillionths of a second after laser excitation. Static surface X-ray scattering, and some time-dependent surface X-ray scattering, can be performed at a synchrotron X-ray source, but to do ultrafast surface X-ray scattering the researchers needed to use the Linac Coherent Light Source (LCLS) X-ray free-electron laser at SLAC. This light source provides very bright X-rays with extremely short exposures of 50 femtoseconds. By delivering large quantities of photons to the sample quickly, the researchers were able to generate a sufficiently strong time-resolved scattering signal, thus visualizing the motion of atoms in 2D materials. "Surface X-ray scattering is challenging enough on its own," said Argonne X-ray physicist Hua Zhou, an author of the paper. "Extending it to do ultrafast science in single-layer materials represents a major technological advance that can show us a great deal about how atoms behave at surfaces and at the interfaces between materials." In 2D materials, atoms typically vibrate slightly along all three dimensions under static conditions. However, on ultrafast timescales, a different picture of atomic behavior emerges, said Argonne physicist and study author Haidan Wen. Using the new ultrafast surface X-ray scattering technique, Wen and postdoctoral researcher I-Cheng Tung led an investigation into a 2D material called tungsten diselenide (WSe2). In this material, each tungsten atom connects to two selenium atoms in a ‘V’ shape. The researchers found that when the single-layer material is hit with an optical laser pulse, the energy from the laser causes the atoms to move within the plane of the material, creating a counterintuitive effect. "You normally would expect the atoms to move out of the plane, since that's where the available space is," Wen said. "But here we see them mostly vibrate within the plane right after excitation." These observations were supported by first-principle calculations led by Aiichiro Nakano at the University of Southern California and Pierre Darancet at Argonne's Center for Nanoscale Materials (CNM), a DOE Office of Science User Facility. The team obtained preliminary surface X-ray scattering measurements at Argonne's Advanced Photon Source (APS), also a DOE Office of Science User Facility. These measurements, although they were not taken at ultrafast speeds, allowed the researchers to calibrate their approach for the LCLS free-electron laser, Wen said. The direction of atomic shifts and the ways in which the lattice changes have important effects on the properties of 2D materials like WSe2, according to Xiaodong Xu, a professor at the University of Washington. "Because these 2D materials have rich physical properties, scientists are interested in using them to explore fundamental phenomena as well as potential applications in electronics and photonics," he said. "Visualizing the motion of atoms in single atomic crystals is a true breakthrough and will allow us to understand and tailor material properties for energy relevant technologies." "This study gives us a new way to probe structural distortions in 2D materials as they evolve, and to understand how they are related to unique properties of these materials that we hope to harness for electronic devices that use, emit or control light," added Aaron Lindenberg, a professor at SLAC and Stanford University and a collaborator on the study. "These approaches are also applicable to a broad class of other interesting and poorly understood phenomena that occur at the interfaces between materials." A novel x-ray technique can image antiphase magnetic domains in antiferromagnets, which could advance their use in spintronics applications.